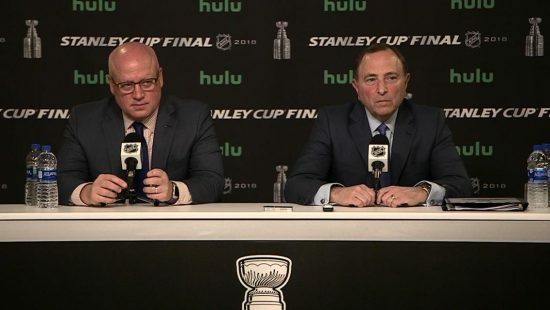 Shortly before the start of the Stanley Cup Final in May, NHL Commissioner Gary Bettman and Deputy Commissioner Bill Daly sat down before the media in Las Vegas and delivered the 2018 State of the League Address. After a brief, uninterrupted opening statement by Bettman, the floor was open for questions, a handful of which were thought-provoking. Through verbal responses and visible body language, both Bettman and Deputy Commissioner Daly proved to the hockey community that they just don’t get it. Gary Bettman went over a checklist of some of the big storylines and accomplishments of the 2017-18 NHL season, including praise for both the Vegas Golden Knights and Washington Capitals and their respective playoff runs. He commended Vegas for “astonishing” the sporting world, touting this most recent Expansion Draft as a success. Bettman went on about Vegas for some time, assuring the hockey world that “there can be no question now” for hockey in unproven markets. There is no denying that the Vegas Golden Knights brought attention to the league, as well as sparked a new demographic of hockey fans. Bettman may have had less fear and uncertainty when making the “leap of faith” for expansion, and he probably feels no fear for the future of the franchise. It seems, though, that he still has fear toward every question and every criticism that comes his way. When the floor opened up for questions, the heat started coming down on Bettman and Daly. Questions about topics as simple and publicly known as the probability of Seattle housing the newest NHL team saw Bettman retreat into a defensive standpoint. Emily Kaplan of ESPN inquired about meetings with Seattle officials regarding a franchise, and was met with a terse statement along the lines of “it’s none of your business.” Bettman would answer such questions with such answers, and grace easier, less prying questions with lighthearted, humorous answers. The mention of a potential “work stoppage” alludes to the fact that if a Seattle franchise were to commence play in the 2020-21 NHL season, it would fall on the same year that the NHL Players’ Association would have the option to request a new Collective Bargaining Agreement from the league. Every time the CBA has been up for renegotiation under Bettman’s leadership, there has been a lockout. And so, Pierre LeBrun did more than ask about expansion, he asked if the league would see another lockout two seasons from now. For a Commissioner who, in lieu of any real efforts to compromise with players on the 2018 Winter Olympics in Pyeongchang, offered to let them participate if they agreed to extend the current CBA until 2023, these sentiments are just that: sentiment. Bettman failed to lay out any plan of action, any roadmap to “labor peace,” and, quite frankly, any hope for hockey in the 2020-21 season. 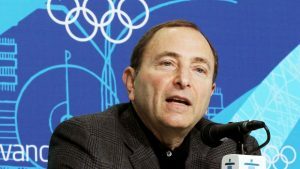 The best questions seemed to come from representatives of The Athletic, as Scott Burnside forced Bettman to followup to Pierre LeBrun regarding the Olympics and the NHL China Games. Burnside alluded to the continuation of showcase games being played in China, and asked if this would bode well, if at all, for renewed potential participation in the next Winter Olympic Games. Gary Bettman’s answer was surprising, in that it shed light on how he felt all along about Olympic participation, but never explicitly said. Bettman exclaimed how from a league standpoint, they have no regrets about staying home from the Olympics. “To the contrary,” he said. He elaborated by saying that decision “certainly had no negative impacts on the NHL season.” What he seems to be missing in all of this is one ultimately important thing: the point. Bettman doesn’t get the point. Or, what’s more likely: Bettman has a different “point” than all players and all fans. Was his decision probably more money-conscious and profitable for the league? Yes. But, is that the point? For him, maybe, but for the league? 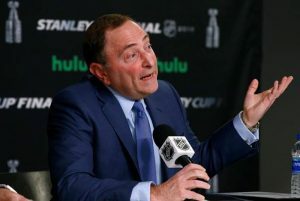 In his closing statements, Bettman joked about knowing Las Vegas was ready to have a hockey team because they greeted him with boos back when he joined them to announce the team name and logo. What is so hysterically tragic about this is that Bettman seems to be content with being hated. He seems to think that for the sake of the league, he has to be a figurehead, a representation and embodiment of everything we, as fans, hate about the business. That’s why if anything became clear after a rather succinct State of the League Address, it was that Gary Bettman just doesn’t get it. To watch the full 2018 NHL State of the League Address and hear every question and answer of discussion in full, click here.